Sired by Classic Rock and Modern Metal ancestors, Tattermask of Charlotte, NC, commingles melodic relics of Ozzy Osbourne, Led Zeppelin, Boston, and Whitesnake with modern riffage akin to Disturbed, Alter Bridge, Evanescence, and Sevendust to forge a fresh sound in the mire of mainstream active rock. Driven by dual lead guitarists Josh Wright and Travis Dry; powered by tight, expressive rhythms from Adam Blackmon on drums & Harley Quinn on bass; and garnished with vocals from Amanda Caines that go from Pat Benatar to Adele to Evanescence at the drop of a hat, sonic variety is the ultimate goal of Tattermask's catalogue of original tunes. Critics and fans have given rave reviews to the band's Carpe Noctem EP (released 2/24/2015). Recorded with producer/engineer Cory Plaugh (Weaving The Fate, Crossfade), the Carpe Noctem record is a strong step up from the band's prior release, ...After the Storm (2011). Listeners from Finland to Japan to Australia enjoy the band's singles "No More" and a 20th Anniversary reboot of Seal's "Kiss from a Rose" on iTunes, Amazon, iHeartRadio and a variety of radio outlets, while audiences across the Southeastern United States gravitate towards the on-stage energy and party atmosphere of Tattermask's live shows. 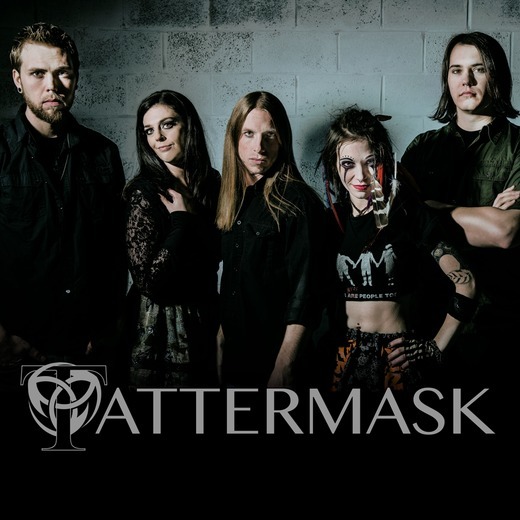 Even some of the national and regional bands for whom Tattermask has been an opening act have paid the band unexpected post-show compliments, such as Righteous Vendetta, Taproot, Soil, Straight Line Stitch, Lacuna Coil, and Eye Empire. After the release of their EP, the band plans to take its live show on the road to meet new fans in the Southeast region of the U.S. and play some conferences and festivals in 2015. Behind Tattermask's somewhat serious musical exterior lurks a silly side, which the band expresses through a series of ridiculous narrative webisodes on YouTube, Photoshop mash-ups on Facebook and Twitter, and Instagram photos of their off-stage antics. Fans who meet the band at a show or follow them on social media say the band's quirky personality leaves a lasting impression beyond the music itself. tat * ter * mask. n. the face we put forward to the world when we are crying inside, so that the aspersions cast by others on the outside will be deflected and won't wound the vulnerable soul within. Only a select few will see the true person behind the battle-wounded, tattered masks we wear.